The Galaxy Tab Active2 was officially introduced last year, but the rugged slate did not make its debut in the United States until now. The tablet comes in two versions – LTE and Wi-Fi only, but it can only be purchased via Samsung's IT channels. It's also worth mentioning the LTE variant has been confirmed to work on the AT&T and Verizon networks. However, since this is an enterprise product, business customers should contact Samsung for more information if they want to pair the Galaxy Tab Active2 with other US carriers. Samsung's rugged slab features MIL-STD 810G certification and it's IP68 dust and water resistant. Also, it comes with an S Pen and a massive 4,450 mAh battery that should provide up to 11 hours of continuous usage. On the inside, the Galaxy Tab Active2 packs a 1.6GHz octa-core Exynos 7870 processor, 3GB RAM, and 16GB expandable storage. It sports an 8-inch display with 1,200 x 800 pixels resolution, an 8-megapixel rear camera, and a secondary 5-megapixel camera in the front. According to Samsung, the rugged tablet comes with facial recognition, improved touch options, and front fingerprint scanner. 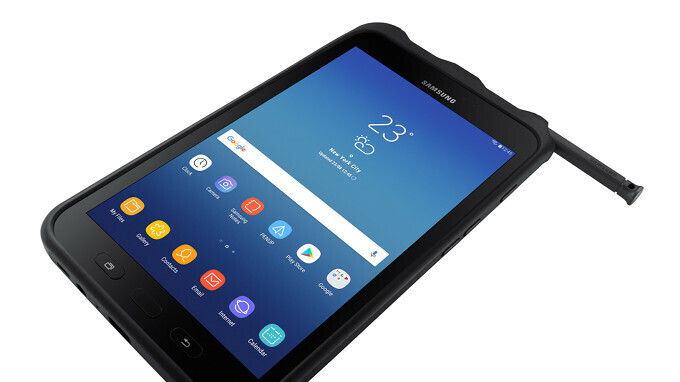 Among the business-oriented features that come with the Galaxy Tab Active2, Samsung mentions fleet management, fast scanning for retail, as well as asset management in the field. It doesn't come with Oreo on board, but Android 7.1 Nougat should suffice for its purpose. Price-wise, the Galaxy Tab Active2 LTE is available for purchase for $520, while the Wi-Fi only version costs $420. Exynos 7870 is soooo 2016! !!! Replaceable Battery: Batteries are replaceable through a removable back panel, so that fully-charged backup batteries can be available and easily inserted, keeping productivity flowing. $420 is a pretty steep asking price for a device that lacks so many features and all for the sake of being rugged. The S Pen and digitizer add value that wouldn't be found in most cheap tablets, but I do agree it's too much, especially with that screen. Lower mid-range tablet in a rugged shell for $420? No, thank you.